Mawr Cottage – Mawr Cottage is a delightful cottage hidden away on a wonderfully remote sheep farm in the Cambrian Mountains just a short distance from Newbridge on Wye and Builth Wells. Sleeping 3 with miles and miles of rugged mid Wales countryside in all directions, this is a great place to walk and ride in real wilderness, and you won’t even be able to get mobile reception! Best of all, if you book a holiday between now and the end of August, you’ll receive 20% off the original price, which means that booking the week commencing 17th August will save you £64. http://www.breconcottages.com/cottage-details/MAWRC or call 01847 676 446. Meadow View Granary – Book a stay at this beautifully converted 17th century granary store tucked away in the sleepy hamlet of Llanfihangel Nant Bran near Brecon, which sleeps 5, boasts fantastic views, a huge variety of walks right from the doorstep and countless wildlife watching opportunities in the surrounding countryside, and you’ll get 20% off all bookings taken in July and August, meaning the week commencing 4th August will cost just £275.20, instead of £344. 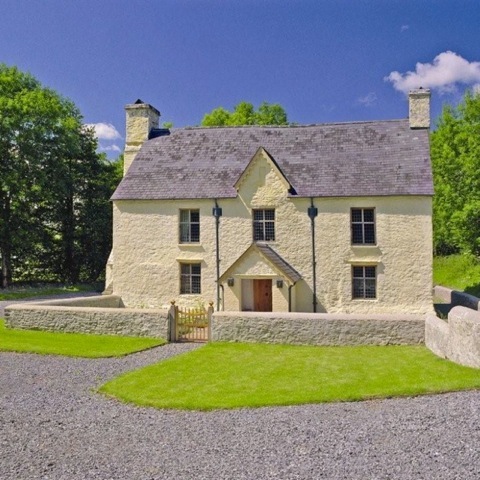 http://www.breconcottages.com/cottage-details/GRANY or call 01874 676 446. 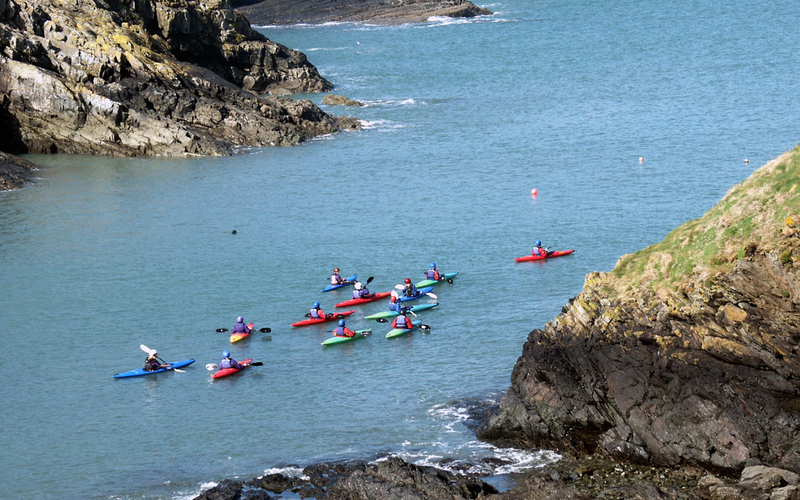 Sea Kayak Odyssey – This summer, Preseli Venture are offering a great deal on their Sea Kayak Odyssey, a 5-day adventure holiday in Pembrokeshire. A fantastic idea for an adrenaline-fuelled summer holiday in one of the UK’s favourite coastal destinations, you’ll have the chance to take in some of the most inspirational sections of the coast, which also combines 5* eco accommodation with a night spent under the stars. Book for August 6-10 or 20-24 for two people and the second can go half price, saving from around £142.50! http://www.preseliventure.co.uk/adventure-weekends/sea-kayaking-courses/ or call 01348 837 709. Devonia – Located just 100 yards from the steps leading down to Tenby’s Paragon beach, Devonia is a spacious 4* accommodation that sleeps 9 and which is perfect for larger family holidays and get-togethers. This is also a great accommodation to bring children, as it is conveniently close to the likes of Heatherton Country Park, Manor House Wildlife Park, Folly Farm and Oakwood. Due to a cancellation, you can book the week commencing 26th of August for just £900, saving over £300! http://www.fbmholidays.co.uk/cottage-details/J332 or call 01834 844 565. Sunny Steps Cottage – Book a week at Sunny Steps Cottage, a delightful terraced hour that sleeps 6, boasts an impressively large 100ft-long enclosed garden that is perfect for al fresco dining, and which is just five minutes from the seafront at North Beach and a little further from the restaurants and cafes of Tenby’s town centre, for any weeks between 20th July and 17th August and you’ll get 20% off the original price, meaning that the original £865 price is knocked down to £692. http://www.fbmholidays.co.uk/cottage-details/K253 or call 01834 844 565. This is an incredibly tasty, quick and cheap meal. Black Mountains Smokery are one of my clients. They are a small client and I have been a big fan of their products well before they asked us to take them on as a client. I regularly order their products for dinner parties, my favourite is the smoked duck and I usually add a couple of packs of the trimmings for quick dinners. These are delivered overnight. 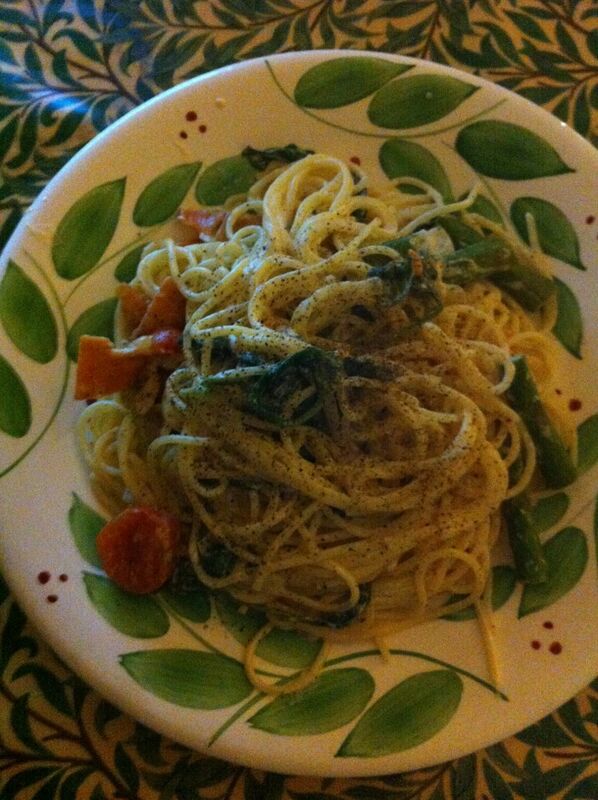 Chop the onion and garlic, halve the tomatoes, chop mushrooms or asparagus and ensure the spinach is washed thoroughly. Slice salmon into small slices or squares, whatever you prefer. Put pasta water on to boil. Start frying the onions in olive oil for five minutes then put the pasta on. Finally add tomatoes, spinach and crème fraiche. At this point the pasta should be ready, drain and add to the sauce. Finally turn off the gas/ heat and add salmon. Serve with lots of fresh pepper.